As a native of North Carolina, Lisa was raised with a strong tradition of Southern cooking. Married for 33 years with two children, she has balanced raising a family and a career, so preparing wholesome meals in a timely manner has become her art form. 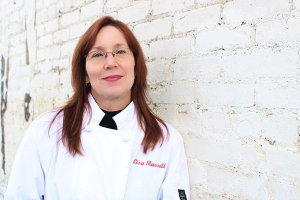 After studying under Chef Donald McMillan, she has broadened her approach to add an air of refinement to her Southern dishes by merging aspects of French cuisine with down home cooking. She also enjoys “playing with her food;” using food in imaginative ways to create edible art and theme dishes for special occasions. Lisa is now pleased to be able to share her gifts and talents with students of The Stocked Pot Cooking School.